I hope you will support our new Kewpie Football coach! He is a great young man! I have known about Cedric through friends, my extensive Kewpie Family and Hickman High School for several years and he is exactly what we need to put our Football Kewpies back on track. 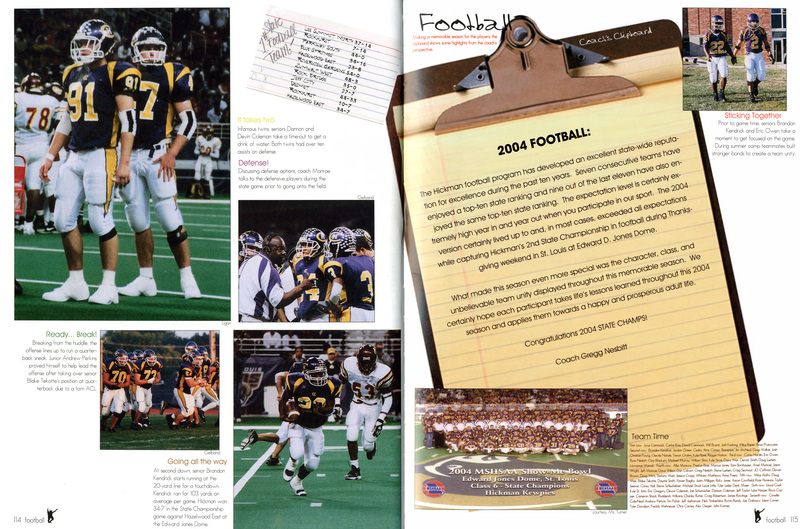 Cedric played on the last State Championship Football Team, The 2004 Football Kewpies. I am sure there could be no bigger thrill for Cedric and all of us alum than to see that Championship brought back to the "Home of the Purple & Gold", where we all know it belongs! I don't know if you have followed our Kewpie Football Team the last few years but there has never been a time the Football Kewpies have needed our support more. I hope to see you at LeMone Field this season rootin' these 2018 Kewpies back to the top!!!!! Below is a note from Cedric. I hope you are able to offer some support to Cedric and the 2018 Football Kewps! As the new head coach of the Hickman Kewpie football team, I am reaching out to you to say hello and ask for your support. In recent years, the lustre of Hickman Football has significantly faded from the stout program and community standards we once experienced. Unfortunately, the facilities and equipment our players are using are in as equally bad shape as our recent wins and loss column. One of the first things I plan to address is the state of facilities and equipment. I want our players to take pride in being a member of the Kewpie Football team. We are repainting our locker room, adding every All-State football player’s name to their locker, and adding a tribute to our past conference, district, and state championship teams. Additionally, we are looking to order updated equipment, new pads for tackling sleds, tackling pads, and we are going to update players’ practice jerseys and pants, while increasing the amount of Hickman gear our players have. My goal in all my endeavors is to increase and promote our truly original Kewpie Culture. As an alumni, the building represents much more than simply a school, but rather a place of growth, a place of learning, a place I learned how some people live, and how a Kewpie lives. First, I want to instill in our players our school’s tradition and the integrity with which our graduates live their lives. Secondly, to emphasize the diversity Hickman has been accustomed to being associated with. Lastly, aim for excellence. We are hosting an Alumni Golf Tournament on May 26th, and are trying to find at least 50 hole sponsorships. Sponsorships start at $100, the next level is $250, and the highest level is $500, any and all donations are appreciated.